Two friends from different culinary traditions wish to learn from each other. The first project is pie. The idea was generated in peach pie season, but by the time we got to it, it had to be pumpkin pie. 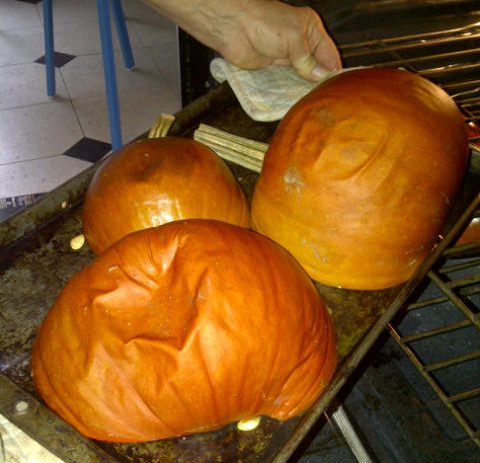 Pumpkins are roasted until soft, then pureed. Lard from the Mennonites at the Wychwood Farmers’ Market makes a tender crust. Fresh flavourings: grated ginger, orange zest, ground allspice and grated nutmeg. Tip: based on experience, if you forget to mix sugar into the pie filling, you can always add it at the end and bake it an additional five minutes. It won’t look like this, but it will taste just as good. I just love your blog, and lately really enjoyed “How Did I End Up in Australia?” (that brought a tear to the eye as I have also come to love the gum trees and the rainbow lorikeet.) Also your pumpkin pie photo essay, as my expat Aussie daughter tries each year to introduce her mates to pumpkin made into a pie. Pies for everything in Australia, but pumpkin?? That’s weird! 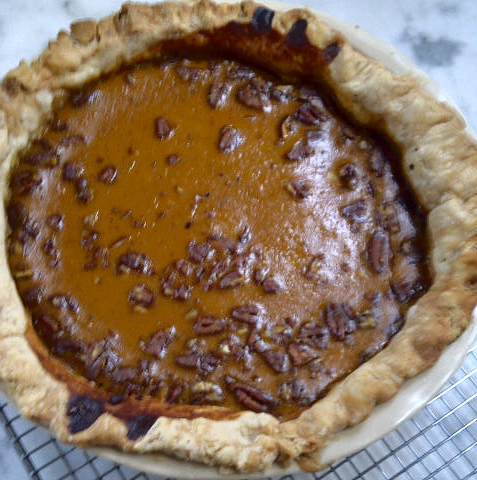 I read your culinary essay about making pumpkin pie. A week later, in my sculpture studio, an image of the crust’s broad thumb prints meandered into my thoughts, the caramelized skin appeared before me while applying little bits of clay to a female maquette. Phantom pains squeezed my stomach, and I thought about envy. How enviable it is to have your art consumed.